Celebrating the varied and ever-changing landscape I grew up in and still call home. Infinitely magnificent! Moment by moment, season by season. Tiny vignettes right in front of us. The everyday world that exists at our feet, transformed by the ever-changing light. Intimate portraits of garden life as if seen from a bug's eye view. 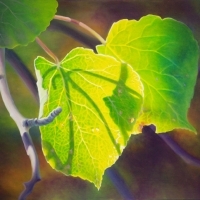 An enchanting world of light and shadow, am orphic shapes, colors, and perhaps a few hidden surprises. Close up views of plants offer such wonderful opportunities to explore color and design, as well as a chance to try to unravel some of their mysteries. Smaller than a postcard, intimate vistas and vignettes of life in Alberta, these little gems are full of life and depth.